Secretary-General Ban Ki-moon addresses the Senate of the Dominican Republic. In a first-ever visit to the Dominican Republic, United Nations Secretary-General Ban Ki-moon today addressed the National Congress, saying “one country with dedication and solidarity can move the world,” helping to spur progress across the three pillars of the UN – development, human rights and peace. In a first-ever visit to the Dominican Republic, United Nations Secretary-General Ban Ki-moon today addressed the National Congress, saying “one country with dedication and solidarity can move the world,” helping to spur progress in across the three pillars of the UN – development, human rights and peace. extreme poverty in all parts of the country, lowering HIV rates, putting more girls in school and more women in positions of power. “I encourage you to do even more to expand education and equal opportunities, create decent jobs and combat exclusion and inequality,” he said, further suggesting that more efforts are needed to take on the difficult challenge of reducing maternal and child mortality. The Secretary-general went on to say that along with progress in development, all countries must renew the shared promise to protect human rights. “We have a common responsibility to establish the conditions for justice and respect for international law,” he said, commending Congress for adopting legislation that seeks to address the problem facing thousands of Dominican-born persons of foreign descent. “I recognize the personal dedication and leadership of President Danilo Medina in the promotion of this new legislation. This represents an important step toward the recognition of the Dominican nationality of these individuals,” said Mr. Ban. Finally, he told the delegates that he has just returned from a “moving” visit to Haiti, and he thanked the Dominican Republic for major contributions to that country, particularly since the 2014 earthquake. He further deeply appreciated its support for the UN Stabilization Mission in Haiti (MINUSTAH). Underscoring that the UN will remain “fully committed to Haiti and to regional stability”, Mr. Ban said that in the coming months he would present to the UN Security Council his recommendations on the future UN presence in Haiti. “We will proceed with caution to preserve the gains in peace and stability. I count on the continued support of the Dominican State for these efforts,” he said. Addressing the press when he arrived yesterday in the capital, Santo Domingo, Mr. Ban applauded the efforts of Dominican Republic President Danilo Medina and Haitian President Michel Martelly to work on improving trade, economic and social cooperation, as well as preventing drug-trafficking issues. “Strengthening bilateral relations between Haiti and the Dominican Republic is essential for the long-term social and economic development of both countries,” Mr. Ban said. He also lauded recent efforts by the Dominican Government to address the situation of irregular migrants living in the country, in particular the adoption of a Regularization Plan last November. “With a large majority of immigrants coming from Haiti, it is critical that the Governments of Haiti and Dominican Republic cooperate closely to provide the necessary identification for Haitians living and working in the Dominican Republic,” noted Mr. Ban. In addition, Mr. Ban praised a law adopted by the Dominican Congress in May that would create a path to citizenship for thousands of people born in the country to parents who are not citizens. In his remarks, Mr. Ban also highlighted Dominican Republic’s commitment to disaster risk reduction and disaster preparation, particularly given its vulnerability to climate change. Mr. Medina is expected to participate in Mr. Ban’s climate change summit on 23 September in New York. Mr. Ban and his wife, Yoo Soon-taek, arrived yesterday in Santo Domingo from Haiti, to express the UN’s strong solidarity with the Government and people, particularly those affected by cholera, and to see first-hand the progress and challenges in the country since the 2010 earthquake. As a sign of UN’s commitment to ending cholera, and ahead of the second phase of a cholera vaccinations due to begin next week, targeting 200,000 people, Mr. Ban said he was going to inoculate himself right after the press conference. During the visit, Mr. Ban called for intensified efforts to ensure access to safe drinking water and adequate sanitation in Haiti, as he launched a new UN-supported initiative and met with families affected by cholera in Los Palmas. There have been around 703,000 suspected cases of cholera and an estimated 8,500 deaths reported since the beginning of the epidemic in October 2010. Mr. Ban did warn, however that Haiti’s political transition could suffer a regression if the long-delayed legislative and municipal elections, currently scheduled for October, are again delayed. “Shortly after my return to New York, I will report to the Security Council on the situation. Sadly, for now, I have little concrete news on progress towards these long-overdue elections,” he stressed. 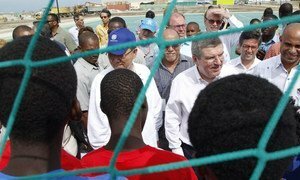 Calling them “the backbone” of Haiti, Secretary-General Ban Ki-moon today praised national police recruits and the efforts under way to strengthen the rule of law in the country, as he continued his visit to the Caribbean nation.